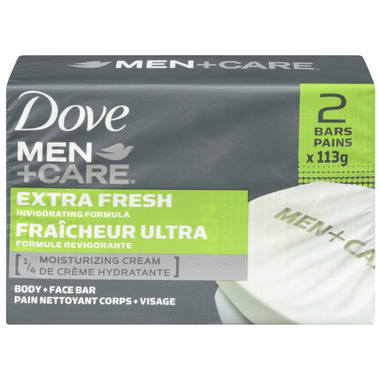 With an invigorating scent the Dove Men +Care Extra Fresh Body and Face bar was developed for men's skin. The ¼ moisturizing cream helps fight skin dryness and helps replenish the skin's natural moisture barrier. This bar rinses off easily without leaving skin feeling dry and tight like with soap can. Dove is the #1 brand of soap or cleansing bar recommended most often by dermatologists. Dove Extra Fresh, especially formulated for men, delivers extra refreshment to your daily shower with its invigorating aroma. What's in the Box: Dove Men +Care Body and Face Bar, Extra Fresh, 113g (2 Count).